3.. 2.. 1.. It’s December and the countdown to the New Year has begun. What’s waiting on the other side? Confetti showers and after parties deep into the night. Hopeful glances to 2019 and bittersweet goodbyes to 2018. Plus, a whole lot of fun in every corner of the world. The worn out adage of a “new you” for the “new year” refuses to die and here’s why: People lose discipline and break their resolutions. This New Year’s Eve presents a new chance to make good on those broken promises. Focus on the night and the year after. When you do, you’ll set yourself up to live out some of your wildest dreams, in 2019. The BucketList crew has curated a list of our favorite things to do on New Year’s Eve. Upvote your favorites, comment on the list, and engage with other Buckaroos. Are you ready for the last and first kiss of the year? A New Year’s kiss is the perfect way to kick off romantic adventures to come. If you have a partner, this is an easy one. However, if you don’t, perhaps a New Year’s Eve party is where you’ll find the next love of your life! Make sure you get out and about, make new friends and stay open to the incredible opportunities of a night where everyone’s happy, filled with anticipation and, ultimately, looking for love. It’s pretty hard to beat a night out clubbing, on New Year’s Eve. Imagine a massive dance floor jam-packed with revelers, dance shows, lighting spectaculars, all your favorite beats and an explosive countdown! Though you can choose your favorite nightclub close by, the world’s top clubs are worth checking out at least once in your life. Some of the best destinations for clubs include Berlin, Rio de Janeiro, Tokyo, London, Sydney, Edinburgh, Bangkok, Las Vegas, Los Angeles and New York. Get together with your friends, family and loved ones to make a list of goals for the New Year. After all, bucket list goals are more fun in a group, as you can keep each other motivated to get them done! For example, if you have travelling goals, find out which friends want to visit the same country as you and start planning. Want to conquer a language? Find a practice buddy so you learn even quicker. Share your goals with fellow Buckaroos and get ready for help and inspiration towards kicking them. … and sleep all day. New Year’s Eve is not the time to go home early. Forget about remembering the first day of the year and stay up to watch the first sunrise instead. With that in mind, you can happily party all night without a thought for the next day. Have no limits and aim to make the night the best one you’ve ever had, which includes forgetting about the time after you’ve done the countdown! No matter where you live, there’s bound to be fireworks happening nearby. There’s nothing like hearing that first crack and watching the explosion of color fill the sky to announce the New Year. If you really want to experience fireworks with a gigantic bang, take a trip to Sydney, Dubai, London, Las Vegas, Miami, Hong Kong, New Orleans or Paris. Remember to have your bottle of bubbly ready to open and your favorite person close by, for a kiss under the bright lights. A rooftop bar is a fantastic spot to watch your town or city celebrate, with panoramic views of the fireworks at midnight. Most bars offer amazing packages for New Year’s Eve, as long as you book early to hold a table. There’ll be music, dancing, dining and plenty of drinking to go with your views, as well as new friends and potential partners for a cheeky midnight kiss. Go on, splurge on the big night. You deserve it after all your hard work this year. Admit it, you've been thinking about it for some time now, maybe even pre-planning those resolutions for weeks. Now it’s time to pull the pin and let it rip! Anything you’ve ever wanted to achieve can go on your New Year’s resolution list. The world really is your oyster and now’s the time to think ahead to glory, for the coming year. Share your bucket list goals and resolutions and get ready to rock your best year yet! Always wanted to try Bollinger, Dom Perignon or Krug? Stop putting it off! Imagine getting to pop the cork as you’re screaming, ‘Happy New Year!’ Remember you deserve to treat yourself and you only live once. Therefore, save a bit of money each day until the big night and splurge on the bottle of your choice. Savoring that first sip is a fantastic memory to start off the new year with and that fizz is the perfect accompaniment to the excitement of the night. Make a few 100 new friends at a street party to celebrate the end of the old and the beginning of the new. Check out what’s happening in your local town or plan to take a road trip to one of the big ones, with all your best buddies. 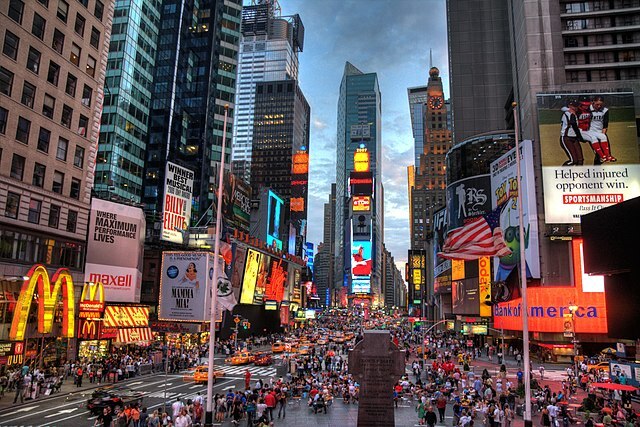 Obviously, Times Square in New York is the biggest. However, the crowds also descend on the streets of Chicago, New Orleans, Grand Park in Los Angeles, San Francisco and San Antonio. Can’t get to any of those? Hold your own and make friends with the neighbors. If you live anywhere near the water, whether it’s the ocean or a river, chances are you’ll find a New Year’s Eve boat cruise to join. Go on a huge ocean liner or a local city ship and get ready to welcome the new year in style! Most cruises offer packages including dinner and alcohol, so you don’t have to think about anything but celebrating. Get a group of friends together and know that you’ll make new ones too. Best of all, the memories you’ll take home will set you up for your best year yet. It doesn’t matter what you’re doing. No matter how crazy the party or how sleepy you feel, watching the ball drop is an essential part of bringing in the new year - at least if you want to bring it in right. It’s the one time of the year where you feel as if you’re standing on a fault line, a foot in the future and the other in the past. Don’t blink, you might miss it.